Kyiv, June 4, 2015. OSCE Special Monitoring Mission reported the movement of militants’ military equipment from Donetsk toward Maryinka in the night of June 2-3: 10 T-64 and T-72 tanks, 122-mm and 152-mm heavy artillery and trucks carrying anti-aircraft mounts were spotted. 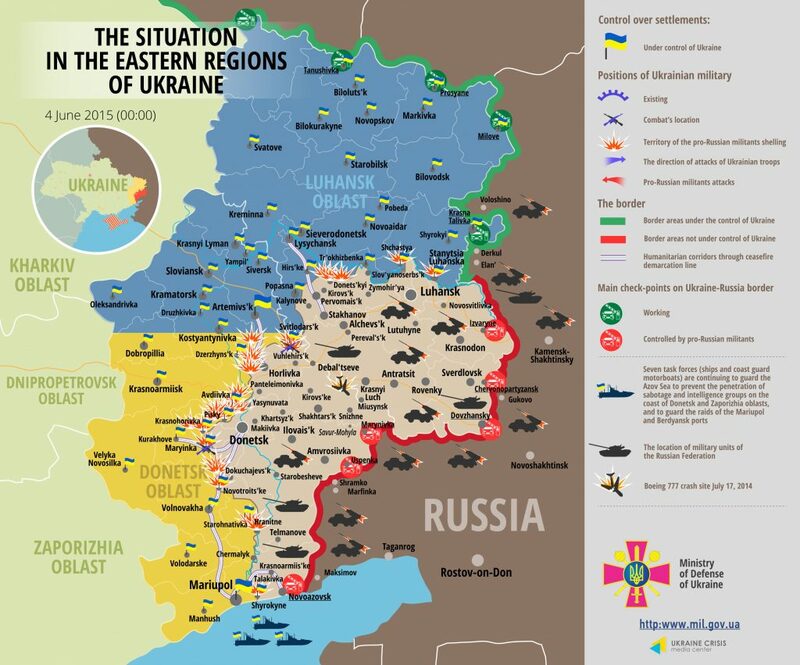 “International monitors also observed incessant artillery fire on the militants part between 4:30 a.m. and 8 a.m.,” said Colonel Lysenko, spokesman of the Administration of the President of Ukraine on ATO related issued, at the press briefing at Ukraine Crisis Media Center. Russia-backed militants lost 80 fighters, while over 100 were left wounded as a result of fighting near Maryinka; 10 armored vehicles were destroyed as well. Most intense fighting took place in the northwestern outskirts of Maryinka, areas around the Donetsk airport and by Svitlodarsk. Pro-Russian militants used large-caliber artillery, 120-mm mortars and tanks, as well as fired from “Grad” missile systems 11 times. Col. Lysenko noted the ATO Command informed Ukraine’s international partners the Ukrainian Armed Forces resolved to use heavy artillery in order to safeguard the lives of their troops and civilians. Two civilians have been killed and five got wounded as a result of militant shelling of Maryinka. U.S. State Department spokesperson Marie Harf condemned intensification of hostilities, arguing that Russia bears ultimate responsibility for implementation of ceasefire. In the Mariupol sector, Shyrokyne was the only spot of fighting; militants shelled it with 122-mm cannons. In the Luhansk sector, pro-Russian militants shelled Stanytsia Luhanska from 120-mm mortars. Two civilians were killed due to the landmine explosion in vicinity of Katerynivka. According to Col. Lysenko, militant subversive-reconnaissance group is suspected in committing this crime. “When examining the site of the tragedy law enforcers discovered subversives’ masked position, mines and other explosive devices and special cords,” he said. Ukrainian border guards spotted 62 enemy UAVs in yesterday. Additionally, there were two Russian UAVs fying along the Ukrainian-Russian state border in Luhansk region. Five Ukrainian servicemen were killed in action and 38 got wounded in the last 24 hours. Ukraine’s Security Service detained a pro-Russian subversive who was trying to blast railway tracks in Kharkiv. Ukrainian operatives also detained a turncoat officer who sided with the “DPR” back in December 2014. The militant joined “Oplot” militant group and informed Russia-backed forces on the Ukrainian forces, passing personal data and cell phone numbers of Ukrainian soldiers,” explained ATO spokesman. One servicemen of the National Guard was liberated after nine months in militant captivity.